Have you ever wondered how much more you are paying for gluten-free ingredients than regular ingredients? 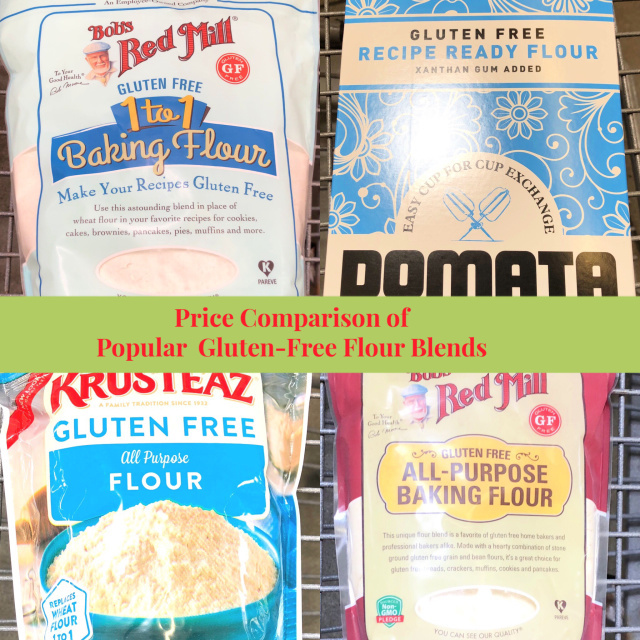 I’ve put together a price comparison of several popular gluten-free flour blends to explore this a bit. I’ve compared blends available at stores local to me including HyVee, Walmart and Target. In researching prices, it quickly became apparent there is a wide variation in not only the cost, but also in the package sizes. I’ve prepared prices by the ounce, pound and cup as well as sharing how much a cup of each flours weighs. For those who bake by weight and not measure, you might find the last bit of great interest. A few details before the comparison: Prices and package sizes were current on March 22nd, 2019 in the Kansas City area. None of the flours included here were being sold at reduced sale prices at the time this was compiled. Not all flour blends are created equal; the purpose of the price comparison isn’t to determine quality or reliability in recipes, but simply to explore what we pay for gluten-free ingredients. One last note: The first flour in the table is NOT a gluten-free flour blend. It is a regular, gluten-FULL flour. It is interesting to compare how much more gluten-free options are, in this case much, much more. It was really eye-opening to me the price range per cup, especially since it is hard at the store to compare prices when package sizing isn’t consistent and the weight per cup isn’t consistent.